DVD - The first ever anthology. Sixteen re-mastered tracks. These long out of print songs offer the perfect overview of the legendary Seattle punk band whose rise was interrupted by the tragic murder of front woman Mia Zapata. 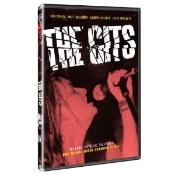 An inspiration to all riot grrrls who followed, The Gits' music lives on in this CD. Street date coincides with the 15th memorial anniversary of Zapata's death and with "The Gits" release on DVD.